Security on the internet has become more important than ever. So we want to take the time to proudly tell you about our PCI/CISP Certification and what that means for you. 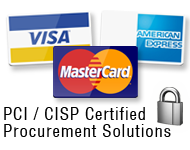 The Payment Card Industry (PCI) is a joint creation of Visa, MasterCard, Discover and American Express. In response to the growing frequency and severity of credit card and identity theft, this organization created the PCI Data Security Standard (PCI DSS), with the overall goal of protecting credit card data wherever it may reside. The Cardholder Information Security Program (CISP) was initiated and mandated by Visa in June 2001 by Visa. In 2004, these requirements were incorporated into the PCI DSS to establish industry wide standards for card security. These standards must be followed by both merchants and providers. With identity theft on the rise, meeting and exceeding the PCI standards is critical for anyone doing business on line including the merchant and the customer. For the merchant, penalties can include $500,00 in fines (per incident), complete loss of ability to process credit card transactions and lawsuits, not to mention major public relations crises. For customers though, in the face of credit card and/or identity theft, they face dozens of calls to be made and forms to be filled out and their credit can be ruined. eProcurement Services is happy to announce that we meet or exceed the stringent requirements of Visa's PCI & CISP programs to ensure maximum security with your sensitive financial data and information. We are now one of the very few companies online that is fully certified! We want you to feel completely secure when ordering from ePS Web Applications. We use a technology called Secure Sockets Layer (SSL), which encrypts (or encodes) sensitive information before it is sent over the Internet. We realize that making purchases on ePS Web Applications, or any other Web site, requires trust on your part. We value your trust very highly, and pledge to you, our customer, that we will work to protect the security and privacy of any personal information you provide to us and that your personal information will only be used as set forth in this Policy. This includes your name, address, phone number, email address, and credit-card information, in addition to any other personal information that can be linked to you, personally. We believe that you have a right to know, before shopping at ePS Web Applications or at any other time, exactly what information we might collect from you, why we collect it and how we use it.